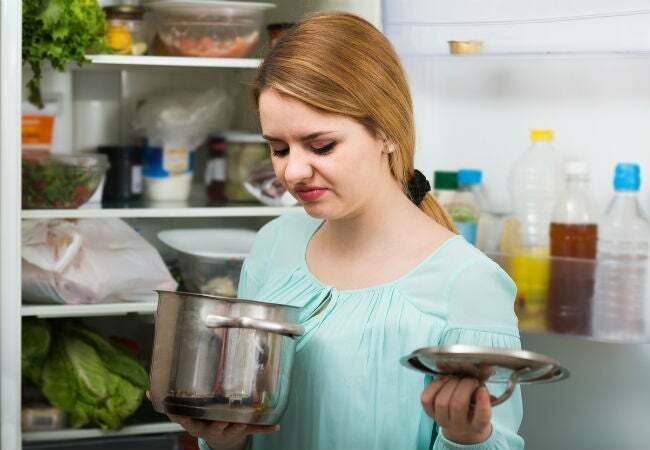 Eliminate whatever weird odors plague your fridge with these easy tips. Typically, when cleaning a fridge, you’ll first wipe up any spills or crumbs with a damp cloth or paper towel. Next, mix one quart of hot water with two tablespoons of baking soda and sponge down all shelves, drawers, fridge walls, and door seals. Treat any caked-on residue with a baking soda paste and, after several hours of set time, scrub away with an old toothbrush. Finally, wipe down the entire fridge with fresh water and a clean sponge to remove all baking soda, then dry with clean rags. 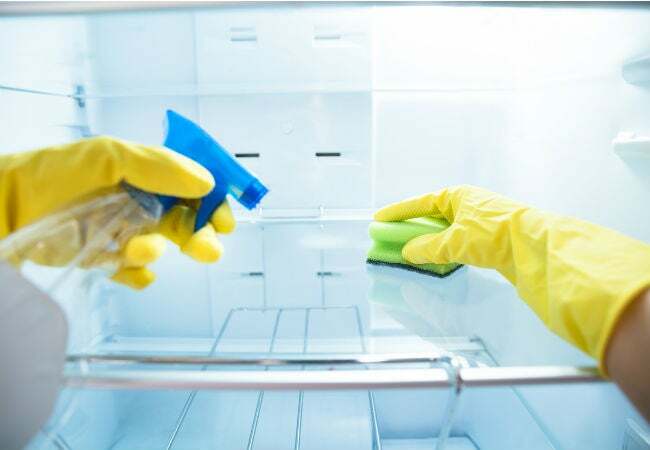 If you’ve experienced a long power outage or feel the need to de-germ, mix one tablespoon of bleach into a gallon of warm water and use this bleach solution to wipe down all fridge surfaces. Rinse surfaces thoroughly with fresh water and a clean, damp sponge. Then, dry with a rag or clean dish towel. Switch off the ice maker before cleaning. Remove the ice bin and throw old ice into a sink filled with either warm, soapy water or a 50/50 solution of water and white vinegar. Use a clean rag to wipe down the ice bin thoroughly, then rinse away all solution with clean water and towel-dry. If your ice bin is dishwasher friendly, wash it on the sanitizing cycle for a complete clean. Finally, sanitize the ice maker with a mixture of one tablespoon of bleach and one gallon of water. Sponge down the inside of the ice maker, as well as the ice bin, with the diluted bleach solution. Rinse away all bleach using a sponge dampened with fresh water. When your fridge’s cooling mechanism become dusty, they are less efficient over time and can even emit a burning smell. Fortunately, cleaning refrigerator coils is as simple as knowing their location and how to access them. 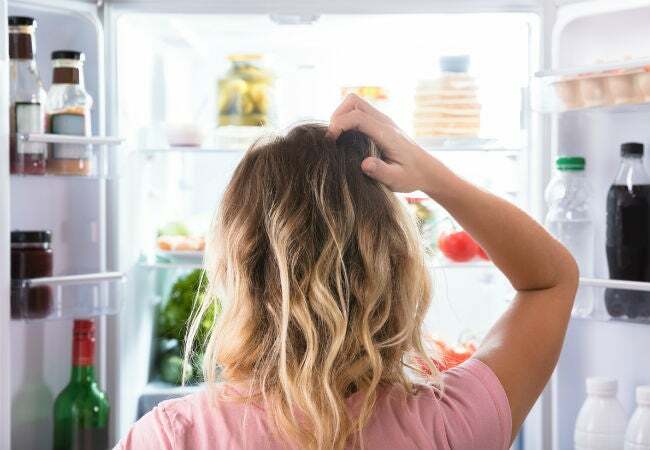 First, unplug the fridge (you might time this task to coincide with the deep-clean). If the coils are located under your fridge, remove the grille at the front; if they are behind your fridge, roll the fridge away from the wall for easier access. Then, brush away any dust and food particles you find using a coil cleaning brush (available on Amazon for $14.20) and vacuum up all loose dust. Replace the grille or roll the fridge back into place. For a good surface-level clean, purchase a non-toxic fridge spray, like Traeger All-Natural Cleaner (available at The Home Depot for $14.99). Follow the cleaning tips above, then spray the inside of the fridge with this cleaner, wiping surfaces with paper towels or a clean rag. You can buy fridge-specific deodorizers, too. 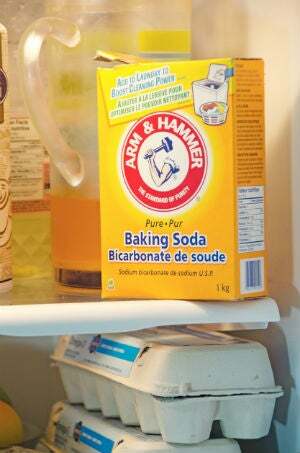 Instead of relying on a baking soda box, place one of Arm & Hammer’s Deodorizer Odor Busterz (available at The Home Depot in a 3-pack for $5.01) in the back of your fridge. Or, consider picking up Fridge-Its Cubes (available on Amazon for $6.24), which contain active charcoal. Unlike your average charcoal briquettes, these cubes are designed to be dust free and to last up to six months with guaranteed food safety.